How many children is too many children? Over the years, we have had just about every amusing and yes, sometimes invasive question or statement hurled at us. Don’t you know what causes that? Don’t you own a TV (some years we didn’t)? Again? How will you love them all? I have exactly two knees and that is all the more children a person needs. You know we believe in zero population control. Are you trying to keep up with the Duggars? What about college? You won’t be able to give them all they need. You know you are crazy, right? Over the years, I have gotten the sincere questions. How do you know when you are done? How many is too many? In October of 2005, our fifth child, Lilly, ten years old at the time, became gravely ill. Physicians shared serious concerns of her imminent death on numerous occasions. She spent two weeks in the hospital and over two years on the road back to recovery. Lilly was released from the hospital one week before I delivered Caleb, our eighth child, a month early. With Lilly’s hospitalizations, her follow-up care and Caleb’s birth, we began to know our pediatricians very well. At the end of one of Caleb’s well-baby check- ups, David and I realized his outfit needed changing. We rummaged through the diaper bag discussing back and forth about the weather and what would be the appropriate clothing to pull over his tufted-blonde head with the piercing blue eyes and onto the rest of his soft, pale, wiggly body. When the decision was made, we looked up and realized that Dr. Joanne was thoughtfully staring at us. Dr. Joanne was leaning on the wall, clipboard snuggled between crossed arms, with her high heels crossed at the ankles as she smiled. My girls loved Dr. Joanne, not just for her bedside manner, but because the woman could wear her heels and dispense medicine in style. For me, his answer was golden. It really spoke to me and resonated deeply. It wasn’t the bank account, or the amount of knees we had between us, or even how old, God willing, I would be when the last graduated from high school. Children and babies may come into our lives as the years pass for different reason. But I knew. I had one more “in me” no matter who thought I was crazy. Lydia, our ninth, would be the last to come from my womb. One more where I was confident we would fuss over her, cherish her, breathe in her newborn scent and have our hearts so full of love for her that she would never feel like “just one more.”. If she was one more, then she was the one more where life slowed and time stopped, because counting her toes, hearing her giggle and watching her smile was precious, so precious it felt like the first time I had seen a baby smile. And it was a first: it was Lydia’s first, to be noticed, remembered and cherished. So, in my book, since I have been asked, how many is too many? When you know in your heart the last would not be loved with all the devotion, dedication and overwhelming awestruck love just like the first. 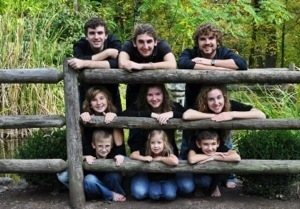 This entry was posted in Kids, Life and tagged children, Duggars, family. Bookmark the permalink. ‘How many are enough’ -simply beautiful. You put into words what my heart feels. Thank you. You are welcome! I am glad to know it resonated with others! I love this! It encompasses every aspect that always comes into question: Provision, stewardship, love, economics, logistics, ect! Thanks Abbey, I am glad you liked it, it means a lot! Jaime, I’m crying! This was really beautiful, thank you for sharing. Thanks Marsha! Love you all and miss you! Thanks for sharing. We just had our sixth, and I have heard all the same questions/remarks. I sometimes find myself asking how many is TOO many!! Thanks for the encouragement. I have found myself saying, wow you would.think he was our first one. He just had his first smile, and it was in response to someone we had all met for the first time. All our girls were so excited. I had to find my husband to tell him and introduce him to this women, our son found so amusing. Oh that first smile, so precious! Congratulations! I love your response to people, what a beautiful sentiment! I too get many questions (some are rude) regarding the size of my family. This is a link to a post I wrote a year ago with a few answers to these questions that I have been known to use on occasion. A Garden Goat blessed with 9 kids! Sweet Friend, I am in awe! Every time I read one of your posts, I think, “Wow, that’s my friend, Jamie, and this is her life.” You make me laugh and cry, sometimes in the same article! I am so excited that you are sharing with the world what I’ve always known, you think and feel deeply about so many things! God has put you here, right here and now, to share your gift of seeing life as a glass half full, no, make that a glass spilling over, and encourage us all to do the same! Sweet friend, your words humble me. To God be the glory! Love you! Oh how I remember when you and I belonged to the same babysitting co-op and there was a certain someone who refused to babysit for either one if us because the number of children we had was too large (I had 4 and I think you had 5 or 6). Makes me sad to think of how lonely and quiet this individuals home must be. Thanks for your writings! They make my day. I’m a dad (widower) with six children, all still in school. I would say it differently. I would never want to say I was done because I couldn’t love another child enough. We did say that we weren’t ready for another child because we were not able to care for another baby…yet. Usually, this just mean recovery from childbirth and getting back in the groove. In the end, illness prevented a seventh child, but if things had gone better we would be hoping for number seven. I’m sure that your perspective is pure, but many could truthfully say that they would not love a second or third child as much as the first and perhaps selfishly and permanently close the door. Truth is, I have never known how much I would love the next baby until I met him. Glad you enjoyed the post Eleanor! Families are wonderful aren’t they? I love your family. That’s what love is all about. Keep up the good work – growing happy, healthy people. Is there more than that??? Thanks for your wonderful article. Once, when I was packing away little onsies and a few tiny stray diapers, I wondered how anyone could ever part with such adorable little things. Then I realised that what how I would know I was done having babies. Some times now, I am a little sad that I’ll never give birth to another child because it is all so amazing. But that passes and I know that I ‘ve had my time and the next phase is just as amazing as the last. And I have 8 kids so I’ve had a lot more amazing than a lot of people I know. I am so glad you enjoyed the post! I love how you phrased, you have had a lot of amazing,what a wonderful way to look at our large families of blessings! We have been blessed with nine, as well, and our little caboose came along six years after his next youngest sibling (who was a miracle birth in that my water broke at 15 weeks, and she & I were never expected to survive). What a delight it has been to become parents again with him and feel like a first time parent all over (wow, so much changes in six years!). LOL He is 3 1/2 now, and it is surreal to have preschool – college children. I wouldn’t change a thing! We have always felt the same way, that the decision was not economic, or even logical, but in the end comprised of two parts: 1. Prayerful consideration 2. A mutual sense of completion. Every family needs to prayerfully make a decision. Every other family needs to respect that decision. Beautiful article. It reminded me of a couple I know who adopted twenty-four children later in life. When someone made a remark about it, the mother very graciously responded, “There’s always room for one more at my table.” We also have nine children. Omg! I cried because that is the exact way that I feel about my babies. Ppl think I am strange b/c we have so much love to give. Thank you so much for sharing. It’s not rocket science… we multiply our love! So nice to meet people who feel the same way! This post brought me to tears, because I have two boys and still feel like I am meant to have more, that they are waiting, but have let doubt and society dictate how many children I have (so far). I want so badly to have a large family! Thanks! It is a challenge to drown out the world sometimes to hear our hearts. I needed this article so very much. I am pregnant with my 6th and I am to the point that I don’t want to tell anybody. We planned this and I want to enjoy every possibly moment before I have to listen to the negatives. I have said since I was a child that I would have 6 and now that I am finally there I feel complete. Why are people so mean? It just astounds me that people think it is okay to say whatever they want. Congratulations on baby #6! I am glad the post encouraged you! People can be mean or at the very least insensitive, but I hope you can put in ” ear muffs” and just enjoy this tremendous blessing! Best to you!